My parents are on their 4th Subaru Outback. They had a 2000, 2004, 2007 and now the 2011. You are totally right. The previous version was by far the best. It drove like it was on rails. The new one is just too big and bulky and doesn't feel much like a Subaru at all. Unfortunately, my parents, who actually buy the things (unlike me), love the newest one the best. 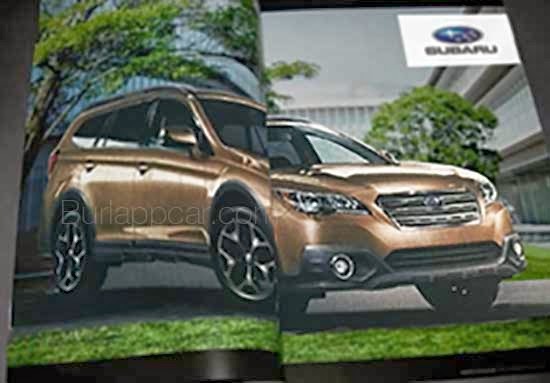 Maybe Subaru is just giving in to what sells. What a very un-Subaru-like thing to do! @ Anonymous: I wonder if they like the newest one because the interior is larger and has more stuff than any prior generation. @ Vince: Agree 100% about the truck face. I hope the Legacy and Outback revert to a more carlike (and ultimately more drivable) vehicle. The current one also handles like a truck... waaaay to heavy and ponderous. If Subie can get away from Toyotafication, but still accept some of their tech help, they could do quiet well. The Crosstour Hybrid was a example of how to do it wrong. Check out the Subaru JDM site - for a preview of the Levorg (new Legacy wagon) accessories. it shoes the front, accent lines, and rear quite clearly, though I expect the Outback to have very different lower bumper treatments. I DO Like what i see here on this pic. Can you tell us where it came from? Is it a Subie manual or a photoshop? I want one! But needs less vanilla.